Losing a tooth has a big impact on your quality of life -- and losing more than one tooth? The effect can be dramatic. When you’ve suffered tooth loss, it’s time for a replacement. Dental implants placed by your cosmetic dentist in Ann Arbor, Dr. James Olsen, restore your ability to eat, speak, and smile as naturally (and as beautifully) as ever. How do dental implants work? And why are dental implants better than other tooth replacements? If you’re like most people considering your options for completing your smile, you’ve got questions about dental implants in Ann Arbor. Dr. Olsen has answers. Dental implants are a whole-tooth replacement. That means they give you back both parts of the tooth: its root and the prosthetic tooth that sits on top. With the stability provided by the dental implant within your jaw, your new denture or crown will be just as secure as your natural teeth. What is a dental implant? It’s a small titanium cylinder that is placed beneath the gum line. Over a recovery period of four to eight months, the dental implant osseointegrates -- or fuses with -- the jawbone. You will wear a temporary tooth replacement in the meantime. Once osseointegration is complete, the dental implant will be just another part of your body, and its restoration can begin. 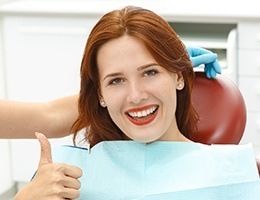 You will return to Dr. Olsen’s office where a connecting abutment will be placed to attach your implant to the new prosthetic device. And when cared for properly with regular oral hygiene and visits to the dentist, dental implants can last a lifetime. Dr. Olsen can let you know whether or not you are eligible for implant dentistry. Eligible patients should have plenty of supporting jawbone. A bone augmentation surgery can be performed in advance of implants to build up weak or insufficient bone structure. Patients should also be in good oral and overall health, free from serious gum disease and conditions that affect the immune system, like HIV/AIDS, uncontrolled diabetes, and advanced-stage cancers. 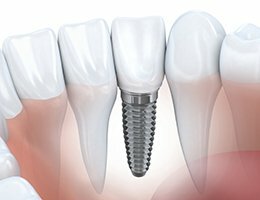 For a single-tooth implant, we will use what is called an implant-retained crown. 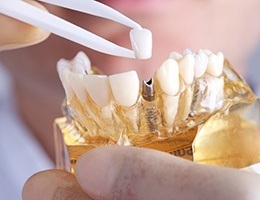 This will consist of three parts: the implant itself, an all-porcelain crown, and a small metal connector called an abutment. The abutment will be used to attach the crown to the implant, and once this is done, it will be virtually indistinguishable from your other teeth. We’ll shape and shade the porcelain to perfectly blend with your smile, and all you’ll need to do is brush and floss to make it last for decades to come. If you are missing a few teeth in a row, then we can actually use implant crowns to support a bridge as well. Two implant crowns will be placed on either side of the gap in your smile, and these will be bonded to prosthetic teeth to close it. Compared to a traditional bridge, implant-retained bridges are much stronger, look more natural, and allow us to preserve more of your remaining teeth. For a typical bridge, healthy teeth have to be shaved down in order to fit the crowns that support the replacement teeth, but with an implant bridge, your smile is left intact. Sick and tired of dealing with your unreliable dentures? If so, we can use dental implants to finally give you a set of teeth you can always rely on. We can custom-make a denture for you that snaps onto multiple implants placed within your jaw. Its hold will be much more secure than your standard removable prosthetic, it will last longer, and your bite force will also be much stronger, allowing you to enjoy a more varied and healthy diet with ease.